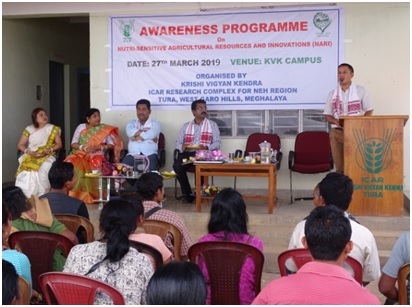 ICAR KVK, West Garo Hills organized an Awareness programme on Nutri-Sensitive Agricultural Resources and Innovation at KVK Campus. The programme was chair by the Chief Guest, Deputy Commissioner of Tura Mr. Ram Singh, and the Guest of honour Shri. M. Arengh, District Agricultural officer, Dept of Agriculture, Tura, Dr. Pushpita Das, Dean, College of Community Science, CAU Tura, and Dr Binew Mathew, Associate professor, Dept of RDAP, NEHU, Tura . About 70 numbers of farmers which comprise of 49 female and 21 male attended the programme. The programme was conducted by Dr. Sagorika Borah, and a welcome speech was given by the Senior Scientist and Head Incharge, Dr Joyshree Mahanta. Thereafter a short speech was delivered by different Dignitaries Guest of Honour and by the Chief Guest. 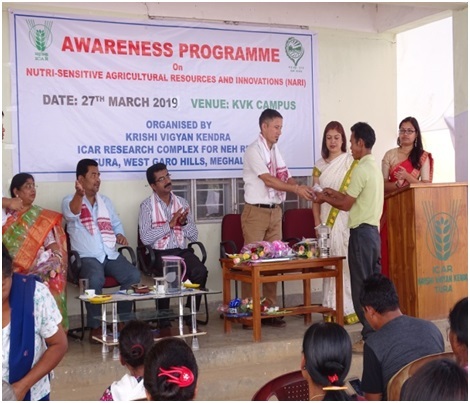 The Chief Guest addresses to the farmers about Agriculture, shortage of water, Nutrition and health care especially about anaemia which is highly prevalent in Garo hills due to lack of Iron folic in the diet and he advice the farmers to cultivate and consume nutritious crops for improving the livelihood of the family. He also suggested our KVK and all the Agriculture Department to help the farmers to prevent clearing of jungles for Jhum cultivation as it affects the environment. 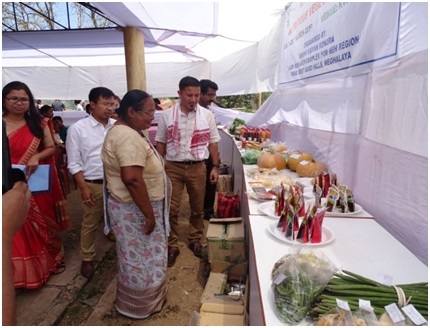 Seeds was distributed to all the farmers and then, Deputy Commissioner visited all the stalls including fruits, vegetables, mushroom and value added products exhibits by the farmers from their own farms. The programme was ended by Vote of thanks from smt Virginia Thabah. 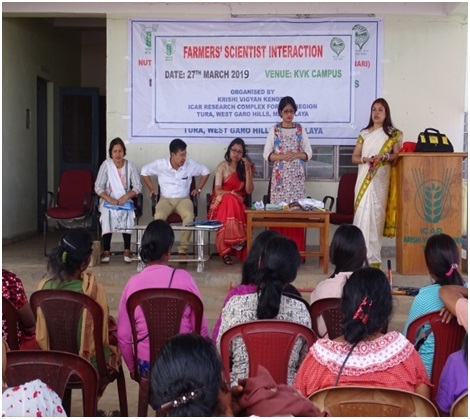 Thereafter a farmer’s Scientist interaction was done and a Resources person Dr Swapnali Borah HOD dept of Family Resources Management, CAU, Tura, also address to the farmers about ergonomic tools and implements. The programme ended successfully.